Turmeric is a spice most often used to add color and flavor to mustard, soups, sauces and Indian cuisine. The yellow spice may seem like a strange beauty aid, but it has long been used in India to remove unwanted hair and inhibit hair growth. 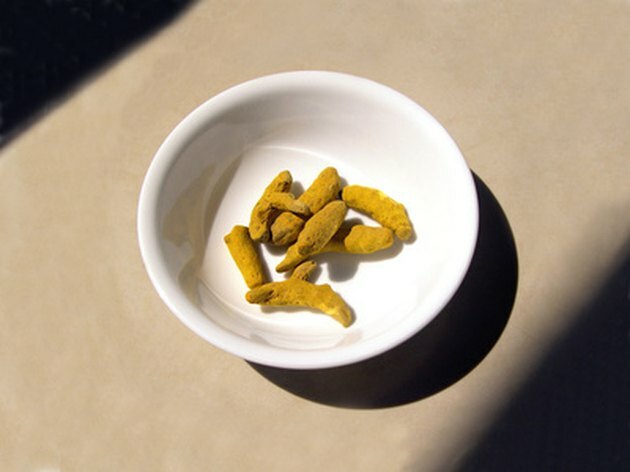 While turmeric is effective in the removal of fine hair, it may not remove dense or heavy hair. You can purchase facial quality turmeric in Indian or Asian markets. Place 1 cup of chickpea flour in a small mixing bowl. Add 1/2 tsp. turmeric and then stir in a few drops of milk or cream. Stir until the mixture forms a smooth, thick paste. Spread a thin layer of the turmeric mixture on the area in the direction of hair growth. Allow the mixture to remain on the area for 20 to 25 minutes, or until the mixture is completely dry. Wipe the turmeric mixture off the area with a washcloth, rubbing gently opposite the area of skin growth. Remove any remaining mixture with warm water. Apply your favorite moisturizer to sooth the skin and replace lost moisture. Chickpea flour is made from ground, dried chickpeas. Chickpea flour is also known as besan flour, garbanzo bean flour, chana flour or gram flour. Ygoy: Will Turmeric Remove Head Hair?